Welcome back in time. The year is 1896 and the Klondike Gold Rush has just started, so pioneers from all over the world are gathering around the Yukon River, Canada, to find precious metals. Will your quest end up with a 2500-coin bag full of gold? Let’s discover by playing Wild Falls, the winter 2019 addition to Play’n GO portfolio of themed slot machines utilizing the provider’s challenging layout with 5 reels, 3 rows, and 20 fixed paylines. Read the Wild Falls slot review and find out where to find the Gold Rush and River of Gold. Want to see how Wild Falls works? Select a recommended casino site from the list below and start playing for free or real – our screenshots will give you a sneak peek! Start by pressing the button determining will you play for fun or for real money. If you opt for the Wild Falls Free Play mode, the game will surely bring more than enough demo credits, so use them all to learn how to win or to set up your own betting strategy. Speaking of credits and coins, you can place 1 coin per round valued between €0.20 and €100. Apart from the quest for gold, your task here would be to line up 3 to 5 icons of the same kind on adjacent reels and collect the prize according to the paytable. With 3, 4 or 5 bags, you’ll receive payouts of 250, 1250 or 2500 coins, while the lower-paying icons of playing cards from Tens to Aces produce 10 to 600 coins for combinations of 3 to 5 of a kind. Note that all Chests have a dual nature and work as both Wilds and Scatters. At a random occasion, the Gold Rush feature will turn all visible chests into Golden Chests with hidden Multipliers of 2x, 3x and 5x. Combine them to land a big win of 125x your stake. When 3 Gold Chests land on the reels, lucky winners will make the Super River of Gold runs freely to improve the payout rating up to 10000x your base win. With 1 or 2 Wild Chests, you will activate the Rapid Re-Spins feature where the Wilds keep falling from the above, so the number of re-spins depends only on your luck. After the third Wild and the third re-spins, you will enjoy the Wild Falls Free Spins. 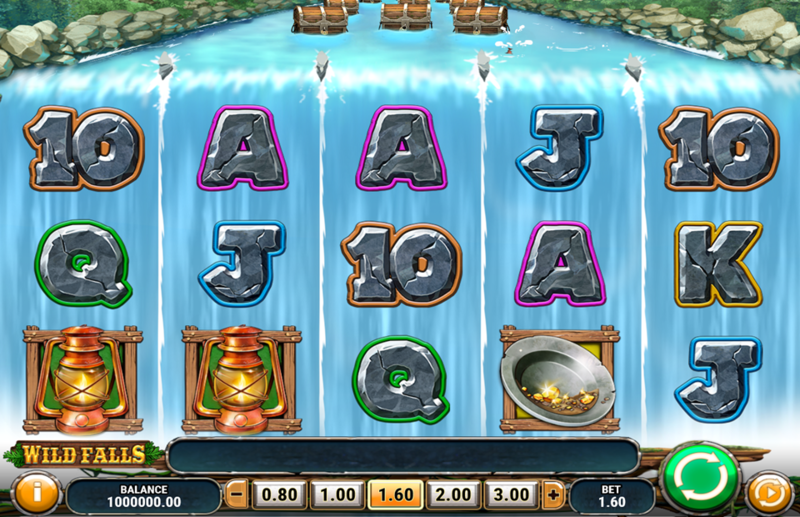 When 3 Scatters land on the reels 2, 3 or 4, you will activate the Wild Falls Bonus game. Chests will now walk down 1 position until finally fall off, but the game will go on and on for as long as you have at least 1 Wild Chest standing on the reels. 3. What is the RTP factor of Wild Falls? According to the official info, the default RTP stands at 96.50%, so our Wild Falls recension sticks to that figure. The action-packed rewarding adventure has more than a few strong points capable enough to keep you busy for a long while. Sizeable static jackpot and recurring extra spins are just among many good reasons to try the Wild Falls tips we gathered in this tutorial.